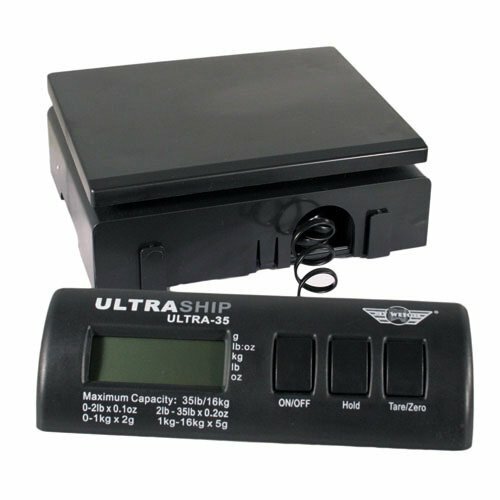 The Ultraship 35 is the culmination of years of development. It is designed to be the ultimate scale for home, office or small business. Whether you're weighing foods, postcards, letters, parcels, envelopes, mailing tubes, padded packs, small boxes, medium boxes or even large boxes, this scale has been designed to suit your needs perfectly. The scale is 8 inches wide, 8 inches deep, and just 3 inches tall. This scale's got a good sized weighing platform... it's 8 inches x 6 inches! From 0 to 2 pounds, it weighs in tenth ounce increments. From 2 to 30 pounds, it weighs in half ounce increments. From 0 to 1 kilograms, it weighs in two gram increments. From 1 to 13.6 kilograms, it weighs in five gram increments.